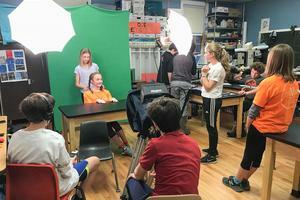 The Calvineers program at the Adams School, under the direction of teacher Bill McWeeny, has been popular with the students at the school for over a decade. The popularity, and the work that the group has done and continues to do in their study of right whales, has sparked the interest of Maine independent film maker Thom Willey. Willey got the idea for the project from a conversation he had with Castine resident Laurie Flood and her daughter Hannah, a Calvineer alum, in October of 2018. They mentioned to Willey, who was looking for his next film project, that he should talk to McWeeny and make a film about the Calvineers. Willey attended a spaghetti dinner fundraiser shortly after, where he met McWeeny before the event had even started. “Laurie and I happened upon Mr. McWeeny carrying a large pot of pasta down the road from the Adams School to the Town Hall where the dinner was. I mentioned I was curious about making a documentary of his group,” said Willey. McWeeny agreed, and brought Willey to the Marine Mammal Conference in Halifax. Willey has been following the students in their travels and research ever since. 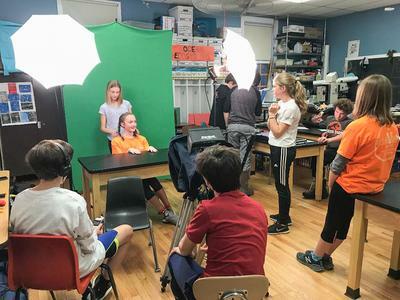 McWeeny said that Willey has gone with the students to all of their conferences and presentations since that first fundraiser, including trips to the New England Aquarium and trips to Lubec, as well as on whale watches. The next big trip for the Calvineers is in 2020, when the students will head to Barcelona, Spain, for an international conference. McWeeny said that he thinks Willey will accompany them on that trip as well, providing the funding comes through. Willey’s timeline for completing the film is not specific. He is instead focusing on getting as much content as he can, regardless of how long that takes. Funding for the project has come in pieces, but Willey said the residents of Castine have “really stepped up to the plate” to help however they can. A Kickstarer campaign is also in the works, and will hopefully go live in the next couple of months, according to Willey. For McWeeny, the most rewarding part of having the film done is that it is entirely about the students. 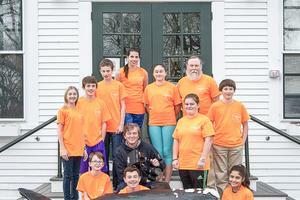 Willey has been teaching those students what he has learned about film making throughout the years. The students, he said, have also taught him a bit about right whales. “I’ve learned that I really want to see a right whale, one in particular,” he said. Snippets of the work the group and Willey have been doing on their film can be seen on The Calvineers Movie Facebook page. Film maker Thom Willey traveled with the Calvineer students to Halifax for a convention as one of the first trips he took with the group in the early stages of filming. 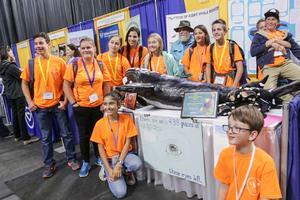 Students in last year’s group of Calvineers take a photo with a right whale replica in front of the Adams School.